A good history of a the rise of the modern way of thinking about nature and its relationship to man. Wulf has clearly researched this exhaustively, and seems to have read every piece of correspondence between Humbolt and his fellow scientists. However, despite effectively depicting the subject's character, enthusiasm, and spirit, this text lacks some of what it describes. I found the final several chapters dragging, although it ends on a very high note with Humbolt's posthumous influence on the great John Muir. In a sentence, it is far more a description of his effects than of the man himself, Initially presented as an adventurer naturalist, it turns out he spends 90% of his life bouncing around Europe and writing books, which are in turn read by people who we are more familiar with (Darwin, Lyell, Thoreau, Muir). Realistic, but not especially interesting. At the same time, it serves as an important reminder of how man remains ignorant of his place on the planet. An important message. Drummond is a good narrator, but at times seems to lack the excitement of the text. In fact, on some words he seems to be imitating Stephen Hawking's [computer's] syllabic pauses, most notable in the pronunciation of the word "nature". As a result...it comes up a lot. So you're reminded of it constantly. I knew Humbolt was a great scientist, but I did not know a tenth of his accomplishments. This is a stunning look at a man who loved biology, geology, and anthropology, as well as human rights and lyrical writing. He invented the concept of ecology, discovered climate zones, and raised awareness of long term human impact on the environment. He inspired revolutionaries such as Bolivar, scientists such as Darwin, and writers such as Thoreau. Today, Humbolt is largely forgotten, but if you read this book you will never forget this extraordinary man. The book introduces Alexander Von Humboldt's life and impact on fellow naturalists of his time as well as the modern understanding of nature. In times of global climate change this book could not be more relevant as it raises awareness through the fascinating and compelling story of AvH. Just like the genius himself the book does not limit itself to one character but brings to live the web of impacts Humboldt's ideas had on German and Anglo- Saxon literature and philosophy, politics in the young US as well as the Latin American colonies, and many more. My favorite book this year. 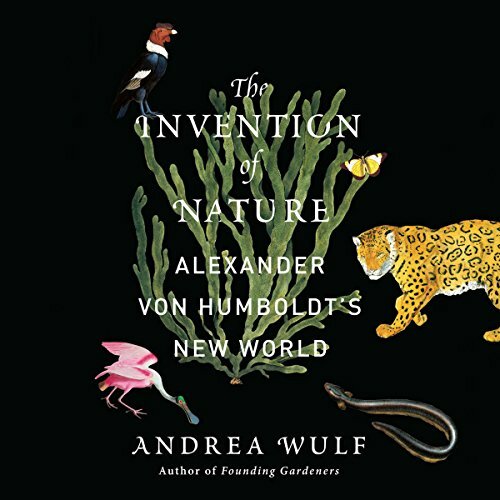 Wulf’s award winning book is a bit different from the average biography in that it is about a history of Alexander von Humboldt’s (1769-1859) ideas as much as it is about the man. Humboldt was a naturalist, geographer, polymath, explorer and the first environmentalist who at one time was the most famous man in Europe. Wulf reveals Humboldt’s discoveries of similarities between climate and vegetation zone on different continents (climate zones). The author discusses Humboldt’s prediction of human induced climate change. Humboldt wrote his scientific observations in the poetic narrative of the times as did Darwin. Wulf discusses Humboldt’s friendship with Thomas Jefferson, Simon Bolivar and Goethe. Wulf is a lucid and intellectual writer. The book is a work of scholarship. Wulf allows the complex personality of Humboldt and his wide scope of interests to come through in the writing. Wulf did meticulous research of Humboldt’s diaries, letters and writings. The author quoted from some of the letters which added to the work. Wulf was born in India, raised in German and now lives in London where she writes. David Drummond does an excellent job narrating the book. Drummond is an actor and winner of numerous Audiofile Earphone Awards for audiobook narration. I enjoyed reading this book and learned much about Alexander von Humboldt. Years ago when I was in school I was fascinated by Humboldt. I wish I had this book to read at that time with its wide range of knowledge of Humboldt. If you are interested in biographies, science or nature you will enjoy this book. I think I was the perfect target audience for this book. I had no idea who Alexander Von Humboldt was, but now I truly do love the man and all of his work. This was an eye-opening experience listening to this book. I loved the book. It's an incredible adventure story, but the reader is just OK.
Would you consider the audio edition of The Invention of Nature to be better than the print version? Simon Bolivar, Charles Darwin, Frederic Edwin Church, Henry David Thoreau, John Muir and many other influential politicians, naturalists, writers and artists have been deeply affected by and inspired by the passion and scientific insight of Alexander von Humboldt. His insights are still pertinent today, yet he is no longer well known in the west. I enjoyed many 'favorite' passages, especially those where famous naturalists like Muir and Darwin repeatedly return to Humboldt's writings for inspiration. The book is emotionally moving and at times upset me and took my breath away. More importantly this book deserves credit for renewing interest in an important and influential historical figure who lost respect and fame after the west rejected anything German after World War 2. Alexander von Humboldt should regain his rightful fame for his affect on modern studies in Ecology, Climatology, Natural History and Wildlife Art. Anyone interested in nature should become familiar with his work. Humboldt had a fascinating life. He met almost everyone of consequent in his age. Nature is an important part of life and it's great to prioritize it in this golden age of technology. He was a true polymath in every sense of the word. Would you be willing to try another one of David Drummond’s performances? No, this was the main negative about the audio book. His style is very robotic which is the opposite of what this book needs. Mostly that Anti-German sentiment has largely removed him from English speaking history lessons. I hope that people rediscover Alexander von Humboldt and his contributions to many fields of science. It is a dense book so not sure I would have managed reading it entirely in print, but found it absorbing while driving in my car. What was one of the most memorable moments of The Invention of Nature? Overall, I am amazed that we know so little in the US about a man who was way ahead of his time (and even ours!) with regard to nature, science, climate change, man's impact on the planet and social justice. He was one of the most famous men of his time and inspired Darwin, Thoreau, Jefferson and just about anyone at the time who had any interest in nature, science or the universe at large. Would you listen to another book narrated by David Drummond? No. I might, but will try to avoid. HIs reading seemed quite monotonous to me, and it was a loooong book. I give him credit for pronouncing words in foreign languages pretty well. Having finished this deeply researched and well-written biography of Alexander von Humboldt, the reader is left with the question of why he is so little known in the English-speaking world. For his life was long and storied, his accomplishments sweeping, and his impact on future scientists, naturalists, conservationist and preservationists undeniable. Wulf has admirably told the story of von Humboldt placed not only in time (born in 1769, died in 1859), but also in nature (and our conception of nature). A liberal thinker and born adventurer, von Humboldt's travels to South America in his youth (a perilous journey and exploration last many years) permanently framed the way he thought of the world. He was staunchly against slavery, saw nature as a whole of interlocking parts, and was a dedicated supporter of up-and-coming naturalists (and later scientists, once that term was coined). The book is amazing in and of itself, but is made even more so as the reader realizes the undeniable impact von Humboldt had despite his lack of name recognition. Wulf makes the entire story that much richer by interjecting chapters about the famous mentors, friends, and followers of Humboldt and how their lives intersected. These chapters introduce the reader to Goethe (the famous writer and statesman, who also mentored von Humboldt), and to military and political leader Simón Bolívar (who von Humboldt met and became friends with before Bolívar's rise to prominence). And von Humboldt's voluminous works on nature informed, inspired, and drove such luminaries as Charles Darwin, Henry David Thoreau, and John Muir. In many way prescient, he articulated ideas of preservation and conservation, of the ecosystem as a whole that can be harmed by depletion of any one of the parts in the chain, of the grandeur of nature. This book places von Humboldt in the pantheon of great thinkers and scientists, highlights his key role in shaping the discussion of nature and our thoughts about the environment, and should make him the household name he deserves to be.